Starting vegetable plants indoors gives you a jump on the growing season. Seedlings begun indoors are often sturdier and better developed than those started directly in the garden. Start most vegetables 4 to 8 weeks before you plan to move them outside, most often after the last frost date for your area. The basics of starting vegetable seeds are generally the same, though it is imperative to follow any further instructions given on the seed envelope for your particular variety. Choose your containers for seed starting. Choose trays for a large amount of plants for a single variety or individual pots or cell-style containers for small crops of less than 10 plants of each variety. Peat pots and other plantable containers work well for most plants, especially those, such as melons, that don't like their roots disturbed. Place packaged seed starting soil mix into a large bucket. Wet it down, and then mix it up with your hands so all the soil is evenly damp. The soil should be moist, not soaking wet. Fill the containers with the soil mix within 1 to 2 inches of the rim. Smooth the surface of the soil with a stick or your fingers. Plant 1 to 2 seeds per pot or cell, or every 3 inches in trays. Plant most seeds to a depth three to four times their width. Plant fine seeds such as carrot on the surface of the soil; then sprinkle a small amount of soil on top, just enough to cover the seed. Wrap plastic wrap over the top of the containers then place them in a warm place, such as on top of a refrigerator, to germinate. Germination rates vary for each plant variety but most germinate within 7 to 28 days. Remove the plastic wrap once the seedlings begin emerging from the soil. Move the seedlings to a window with full sunlight. Keep the soil moist at all times and the seedlings warm, at least at room temperature. 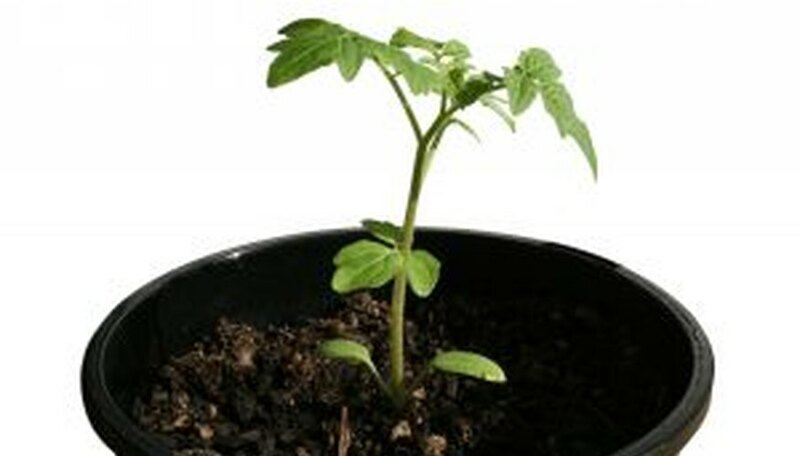 Fertilize with liquid plant fertilizer 4 weeks after sprouting. Prepare the seedlings for transplanting by hardening them off for 1 to 2 weeks beforehand. Place plants in a sheltered area outside for 2 to 3 hours, gradually increasing the time outdoors each day so that they are spending the whole day outside by the end of the 2 weeks. Transplant outdoors after night-time frosts have passed, and the seedlings have produced at least two sets of true leaves. Grow seedlings under grow lights if an optimal window is not available. Sow container garden plants directly in the container they will inhabit. Do not place seedlings under lights until they have emerged from the soil; otherwise they may rot.